← Colorado Springs, Colorado. 20th January, 2014. There’s an ongoing traffic alert if you’re heading to the North American International Auto Show in the next couple of days. 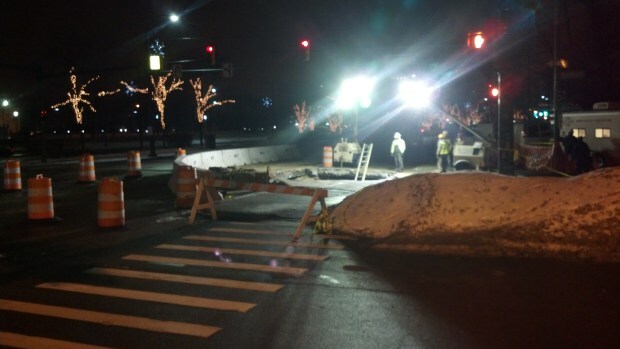 There’s a sinkhole in downtown Detroit that may affect your drive. The sinkhole measures about 10 feet by 10 feet and is on Randolph street at the intersection of Jefferson right by the Coleman A. Young municipal building and the Millender Center. M-DOT Spokeswoman Diane Cross says they’ve blocked the right westbound lanes of Jefferson there coming off of I-375 into downtown. “Well, unfortunately we are a pretty old city, we have older substructures underneath the roadways, and so at the moment we are not sure,” said Cross. “Age is always a factor – that’s going to be the kind of thing that’s going to have to be determined as well. Cross recommends taking an alternate route like the Lodge if you’re headed to events such as the auto show until repairs are complete.